It’s said that the best things in life are free. For the things that have cost attached, there’s some form of currency. In Swaziland, cash is king. While some people have bank accounts and access to credit cards, this is not super common especially in more rural parts of the country. Swaziland’s currency is known as the lilangeni (pronounced lee-lon-gay-knee) for a singular unit, while multiple units are called emalangeni (pronounced eh-mah-lon-gay-knee). Prices in emalangeni would be expressed as E10 for something costing ten emalangeni. Swaziland’s Central Bank has authorized two different currencies to be used in the country. In addition to the emalangeni, the South African rand is also used. While both currency’s notes are used indiscriminately, rand coins are rarely accepted outside of border communities. The emalangeni and rand both come in note denominations of 10, 20, 50, 100, and 200. Both currencies also use different colors for the different denominations. 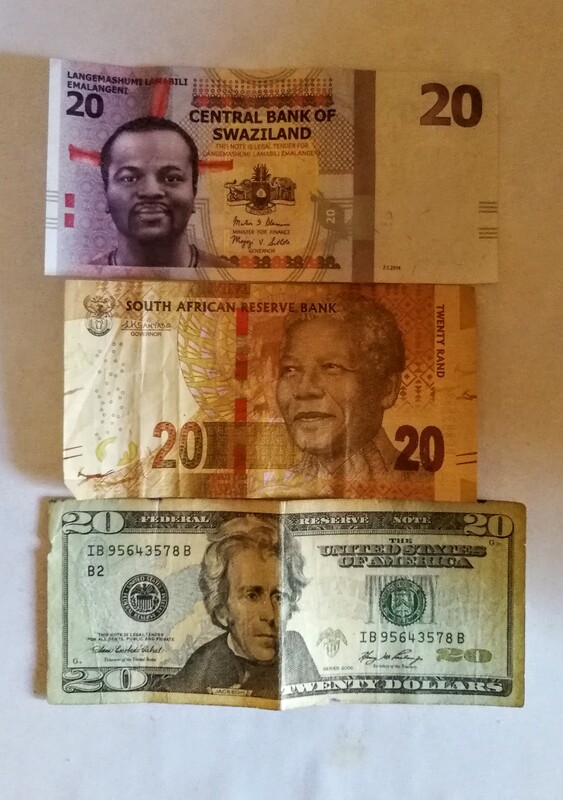 While all South African rand notes feature a picture of former president, Nelson Mandela, Swaziland’s emalangeni notes feature King Mswati III. Prior to Mswati’s ascension to the throne, Swazi notes featured King Sobhuza. In the picture above, there are current notes (of 20 unit denomination) from Swaziland, South Africa, and United States. P.S. – Imali (pronounced ee-mah-lee) means money. Prior to joining the Peace Corps, I would have considered myself a fairly active person. I maneuvered the streets of DC on bike. Twice a week, I would join the greatest November Project tribe in the world for an early morning (running-oriented) workout. Although I ran with those wonderful folks, I never really considered myself a runner. A cyclist? Sure. But a runner? Not I. There is major opportunity here to be sedentary, which is tempting with many movies and television shows on my hard drive that I haven’t seen yet. There have been glimmers of hope as I have seen others riding bikes in my community. The thing is that I currently don’t have a bike. While I’m hoping that this changes soon, I have a desire and the energy to be active now. Enter community runs. I’m not particularly fast or good at it, but I try to go out at least once a week for a run. I’ve found that this does a few things. First, it gets out all of that built up energy. Strangely, the more that I run, the more that want to run. Second, it allows me to explore new parts of my community and make maps of it (with my GPS watch). It helps that the watch tells me to move and posts my efforts to Strava. Lastly, it gives me the opportunity to meet and see various community members while they meet and see me. 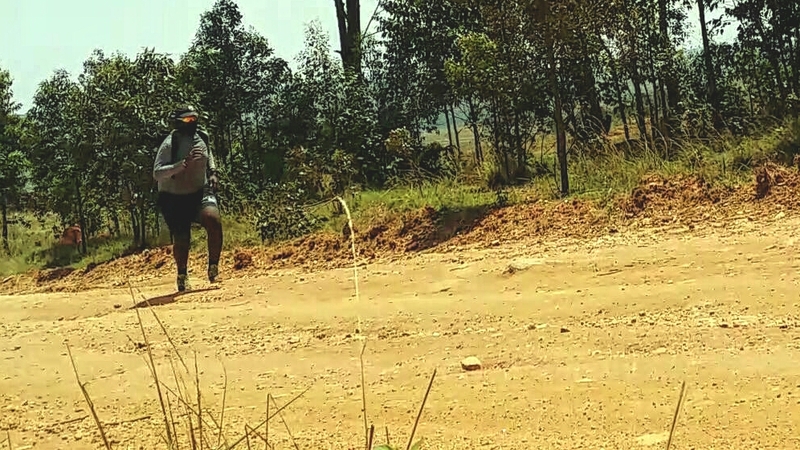 Some people have even commented when they see me, “Uyatsandza kugijima!“, or “you like to run!” I smile and laugh. I don’t know if I would classify running as something that I like, but I don’t hate anymore. I’ve even thought about signing up for one of those races. A 10K or half marathon, maybe? Because why not? P.S. – I just want to say #GoBlue and #HowBoutThemCowboys! It was a sweet rivalry weekend.